A Turkish government official said the United States was behind the failed coup attempt in Turkey. Labor and Social Security Minister Suleyman Soylu accused the Americans despite U.S. President Barack Obama’s call Friday for all sides in Turkey to support the democratically elected government of President Recep Tayyip Erdogan. The Obama administration has provided support for Muslim Brotherhood-aligned states such as Turkey and the government of Egypt, when it was headed by Mohamed Morsi. “The U.S. is behind the coup attempt,” Soylu said. “A few journals that are published there [in the U.S.] have been conducting activities for several months. For many months we have sent requests to the U.S. concerning Fethullah Gulen. The U.S. must extradite him,” he said. Meanwhile, the U.S. has resumed air missions out of Turkey’s Incirlik air base after the Turkish government on July 16 shut down access to the base where the U.S. and other NATO allies station combat units for strikes against Islamic State of Iraq and Levant (ISIL). American forces stationed at Incirlik had been put on condition Delta, the highest alert level, after power was cut to the base, reports said on July 16. The Turkish government had ordered a no-fly zone around the air base. Eleven Turkish military personnel were arrested at the base for alleged complicity in the coup, a Turkish official said on July 17. Erdogan’s government has detained about 6,000 people in a crackdown on alleged coup plotters and government opponents, the Justice Ministry announced. Prime Minister Binali Yildirim told reporters that 2,839 military officers, including 29 colonels and over 40 generals, were taken into military custody on July 16. 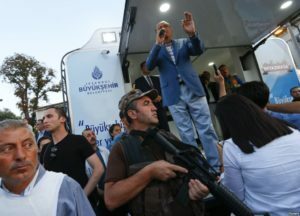 More than 100 judges and military officers were detained on July 17 over alleged ties to the attempted coup, the Turkish-run Anadolu news agency and CNN Turk reported.